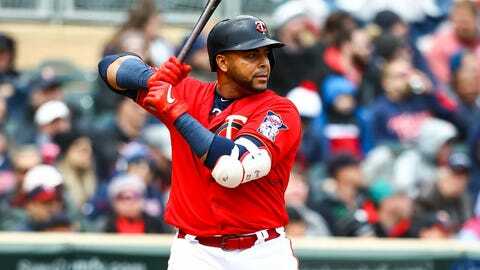 Deployed exclusively as a designated hitter through five games this season, veteran Nelson Cruz won’t be in the lineup Friday when the Minnesota Twins open a three-game road series with the Philadelphia Phillies. Going forward, new manager Rocco Baldelli might want to reconsider. After 15 seasons in the majors, “Boomstick” isn’t slowing down. Cruz, who turns 39 in July, is hitting the ball harder than ever. Cruz has an average exit velocity of 95 mph since the beginning of 2018, third in the majors by a hair. Aaron Judge and Joey Gallo lead the league over that span at 95.1 mph. He’s 6-for-18 at the plate with two doubles and a home run in 2019, with an average exit velocity of 96.6 mph, 10th in the majors. Cruz hit the Twins’ only home run of the season in the fifth inning of a win over the Cleveland Indians on Sunday, smacking a 427-foot bomb off Carlos Carrasco at 109.9 mph. He’s particularly dangerous early in the season, but so is the Philadelphia Phillies’ new star, outfielder Bryce Harper. Harper and Cruz are one-two in home runs during March and April since the former entered the league in 2012. Harper leads the league with 44 such home runs over that span, while Cruz is tied for second with Milwaukee’s Ryan Braun at 42 home runs. Cruz hasn’t seen the field much over the past two seasons, appearing as a DH in 147 games in 2017 and 136 games in 2018, but it’s not out of the question. He’s made nine appearances in right field over that span, including four last year, all starts. — Cruz has hit the Twins’ only homer this season, but the numbers suggest that more are coming. Minnesota has the league’s highest launch angle at 17.3 degrees, as well as its second-best line-drive rate (29.6%) and its third-highest fly-ball rate (28%). — Minnesota might need a few dingers to keep up with Philadelphia. The Phillies are hitting .269 as a team this season, fifth-best in the majors, and a league-leading .348 with runners on. — Twins pitchers have thrown just 70 sliders through five games, 20 fewer than any other team in the majors. Jake Odorizzi, set to start Friday, has accounted for just eight of those, or 18.2% of his 92 total pitches. — The two teams have one thing in common: They’re following sub-.500 seasons with hot starts. The Twins (4-1), Phillies (4-1), New York Mets (5-2) and Baltimore Orioles (4-3) are the only teams in the majors with four-plus wins this season that finished below .500 in 2018.